Notice! Haydarpasha Palace does not accept reservations at this time. Please try again later. Haydarpasha Palace Contact. Opening in summer 2016 ,Haydarpasha Palace ,with its 496 rooms spread over an area of 37.000 square meters ,is 65 km distance to Antalya International Airport which has its guests experience a magnificent holiday with its thematic architecture which is a reflection of historical train station, authentic decoration, comfort rooms and warm atmosphere. Haydarpasha Palace that is in Alanya,Türkler the pearl of the Mediterranean coasts, offers its guests options of comfort, flavor and entertainment all together and gives them various opportunities to draw away from the rush of daily life in order to have a wonderful time. A holiday experience full of entertainment awaits you at this hotel which will host outstanding shows and performances on its stage prepared by animation team throughout summer. Spa and wellness centre is here to make you to feel refresh and relax your body and mind in tranquility.There is a wide variety of indulgent treatments available from Turkish Baths to Thai massages. Haydarpasha Palace accepts VISA and reserves the right to temporarily hold an amount prior to arrival. Haydarpasha Palace accepts Master Card and reserves the right to temporarily hold an amount prior to arrival. Haydarpasha Palace accepts Maestro and reserves the right to temporarily hold an amount prior to arrival. Haydarpasha Palace accepts Bank card and reserves the right to temporarily hold an amount prior to arrival. Haydarpasha Palace accepts ATM card and reserves the right to temporarily hold an amount prior to arrival. Free buffet meals in the morning, lunch and dinner. Some national and international alcoholic and non-alcoholic beverages are free of charge 24 hours. 5 different A'la carte restaurants are available. Pre-booking is required from Guest Relations for restaurants. The minibar is refreshed every day with beer, cola, fanta, juice, water and soda. Pool Bar, Pool Bar, Snack Bar, Beach Bar, Indoor Restaurant, Lobby Bar, Water Gym, Indoor Pool, Water Slide, Pool Outdoor, Fitness Center, Table Tennis, Aerobics, Sauna, Boccia, Hammam, Mini Club, Children's Pool. 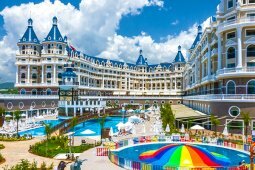 Internet Cafe, Fresh Fruit Juices, Doctor, Game Room, Market, Hairdresser, Telephone and Fax Service, Cinema Hall, Shopping Center, Laundry, Photo Service, Jet Ski, Massage, Peeling and Skin Care, Bowling, Billiards , Parachute, Spa Center, Water Sports, Mountain Biking, Motorized Water Sports. High speed wireless internet is free, low speed wireless internet is free. The fee for a bathrobe is rented on a daily basis. Infinity and water slide pool on the beach; at the beginning of the season until April 30 and at the end of the season from October 15. Access to the Haydarpasha Palace rooms starts at 14.00. The departure time from the rooms is no later than 12.00. Tesise pet is not accepted. The use of open spaces that serve as a test is dependent on seasonal conditions. The Ultra All Inclusive accommodation is accompanied by an evening meal, includes dinner until the number of nights left, and ends on the morning of departure with breakfast. In case the room to be accommodated is a special type of rooms such as a family room, a suite room (and so on), the fee is not made if any of the guests staying at the hotel leave prematurely. What I liked the most about this hotel is the rooms! Very nice and new, comfortable beds! Always enough towels! Everything you need even the toothbrush and toothpaste is there. Even though we were only 2 people we were given the room woth 2 floors and 2 bathrooms which was cool! The interior of the hotel lobby inside is gorgeous. The dinner buffet was pretty good too but I didnt like that in order to go to any other restaurants you HAVE to be there at least 1 week otherwise you can ONLY go to the buffet. The entertainment is pretty bad.. There is a lot for kids but really nothing for adults. The shows are lame with just one belly dancer and thats it I dont think this resort is good for single people or couples its mostly familes with many kids. The worst thing was the cocktails. They do NOT KNOW how to make cocktails. I and ended up always getting beer. Cocktails tasted terrible.I wouldnt call this a 5 star resort. Maybe 3.5 stars. We are planing to come in this hotel at the end of july. We have a question what about the river near your hotel? Isn't there any smell or rubish comming to the sea from it? What nationality people are the main customers in your hotel. Thank you. The honeymoon couple must present their marriage certificate to the authorities upon arrival at the hotel. - Breakfast in bed the next day.